European astronaut Alexander Gerst posted this image of an aurora from the International Space Station on Aug. 29, 2014. The northern lights are a stunning sight for people on Earth, but even astronauts can see the incredible light shows from outer space. Last week, NASA astronauts Reid Wiseman, Steve Swanson and European Space Agency astronaut Alexander Gerst all captured some amazing photos and a video of the auroras from space on the International Space Station. 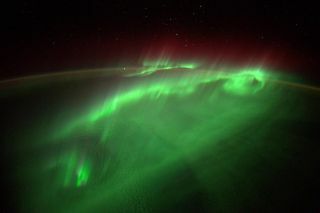 The astronauts even got the chance to fly into the glowing green lights of the aurora while on the station. Astronaut Reid Wiseman snapped this image of a loop of green light from an aurora below the International Space Staiton on Aug. 27, 2014. Gerst and Wiseman shared several incredible photos of the northern lights glowing green and red on Twitter. One of Wiseman's photos shows an enormous green loop of light stretching out below the space station. "We can't stop looking outside," Wiseman wrote on Twitter. The northern lights can stretch as high as 250 miles (400 kilometers) above Earth's surface, a bit higher than the average height of the International Space Station's orbit. Red and green auroras glow below the International Space Station in this photo from Alexander Gerst posted to Twitter on Aug. 29, 2014. "Swimming in an ocean of glow," Gerst wrote in another Twitter image description. "In some moments it feels like Earth is actually alive." Swanson shared his image of the dancing green lights on Instagram. His image also shows a loop of green and the space station's robotic arm in the foreground. A red hue shines above the green lights with Earth framed by stars in his image. Astronaut Steve Swanson posted this image of auroras below the International Space Station to Instagram on Aug. 27, 2014. Auroras on Earth are created when charged particles from the sun interact with the planet's atmosphere. Solar wind blows the particles toward Earth and the planet's magnetic field captures them, pulling the ions and electrons toward the poles. When the charged particles interact with neutral particles in the atmosphere, it causes the distinct glow of the auroras. Another photo from Gerst posted Wednesday (Sept. 3) shows the Russian Soyuz spacecraft used to ferry astronauts to and from space above a sea of green light. The moon shines to the left of one of the Soyuz capsules. "The #Moon, about to dive into a glowing ocean of green," Gerst wrote as a caption to the image on Twitter. The moon shines to the left of a Soyuz capsule in this image of auroras below the International Space Station posted by Alexander Gerst on Sept. 3, 2014. Editor's Note: If you capture an amazing photo of auroras on Earth or any other night sky view and want to share it for a possible photo story or gallery, send images and comments in to managing editor Tariq Malik at: tmalik@space.com.